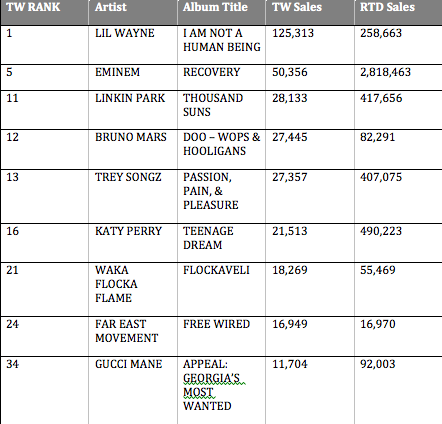 Thought I’d add a new section to the blog… In case you were wondering about how your favorite artists’ album is selling, here is an excerpt that lists a few popular artists including their rank (TW RANK), last week’s sales (TW SALES), and their sales from release to date (RTD SALES). This is for the week ending 10/17/10. I’m surprised to see such low sales from Far East Movement.